Pearl 14in x 6.5in Ian Paice steel shell snare with internal muffler and superhoops. Pearl is proud to announce the newest addition to our signature snare drum line. The Ian Paice Signature Snare Drum. 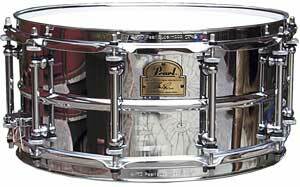 This 14" x 6.5" Chrome Plated SensiTone shell features Stainless Steel Tension Rods and SuperHoop II rims. Stop-locks on the tension rods give you the satisfaction of knowing that your tuning will stay precise and accurate as you explore the drum's sonic range. Ian's drum uses our classic internal muffler to attain its contemporary sound. This drum is destined to be a collector's item. Ian has played with Deep Purple since their inception in 1968 which translates to 30+ years of unrelenting rock drumming. "Purple is a very demanding band to drum for. They are a loud band and it makes you play hard all the time. It's no good turning down at all."